ING is well-known for offering no-frills, and low-cost, banking options. And, of course, the same company that owns ING also owns ShareBuilder®, a discount online brokerage. If you are considering a long-term, automatic investing plan, ShareBuilder can be a good option. However, if you want something more advanced, you might need to look elsewhere. Additionally, you can also access 401k rollovers and small business 401k accounts using ShareBuilder. Your investment choices are fairly standard and straightforward as well, including stocks, ETFs, mutual/index funds, options, IPOs. It is also worth noting that ShareBuilder offers the ability to trade on margin, so that your gains (and your losses) are magnified. The truth is that you can probably get better prices when engaging in real-time or day trades at other online discount brokerages. Indeed, online trading is $7.95 a trade at ShareBuilder — higher than the prices you would pay at TradeKing or Zecco. And, even though there are some mutual funds that you can trade without paying a transaction fee, there are also funds that cost $19.95 a transaction at ShareBuilder. Unfortunately, many of the mutual funds that have no transaction fee also come with higher expense ratios. You are probably better off visiting sites like Fidelity and Vanguard for less expensive mutual funds. The Basic plan can be well-worth it if you only make a purchase once or twice a month. The fee is only $4 a transaction with the automatic investment plan. Trades outside the automatic plan, though, will cost you $9.95, so you will have to take that into consideration. If you make more automatic investments each month, the subscription for the Advantage program can also be worth it. The monthly cost is $12, but you get the first 12 automatic investments included, so it works out to be $1 per trade. However, if you trade outside the plan, you will pay $7.95 per trade. 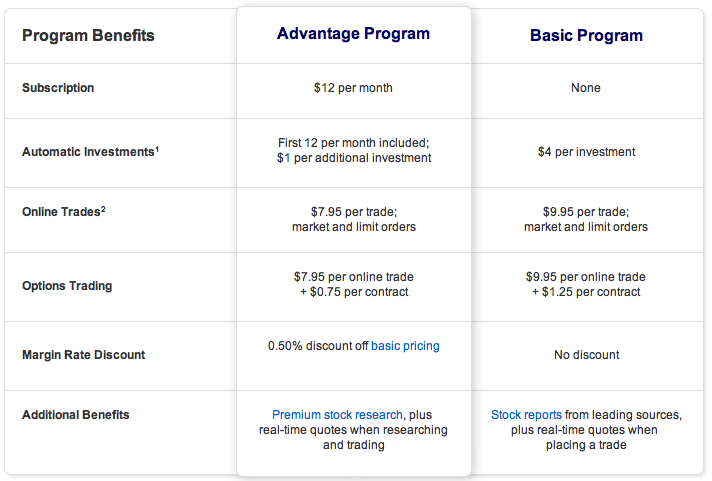 The Advantage program does come with discount pricing on margin trading. In most cases, the automatic plan is only worth it if you limit your monthly trades. If your investing strategy consists mainly of dollar cost averaging with an automatic purchase once a month, the Basic plan isn’t a bad deal. If you want to make three or more automatic investments each month, the Advantage plan can be a good deal — as long as you aren’t doing trading outside the plan. It is nice, too, that your money sits in an interesting bearing money market account if it isn’t being invested. The returns are low, but, in most cases, better than getting no returns. ShareBuilder is intuitive and easy to use. I really like how it is possible to connect the ShareBuilder account easily with the accounts you hold at ING. This makes it simple to add funds to your investment account, or to withdraw money from your investment account and put it in one of your ING accounts. You can easily see your portfolio’s asset allocation, as well as get an idea of how your investments are doing. The account summary also includes information on your cost basis, and whether you have overall gains or losses — something that is helpful at tax time. ShareBuilder also has an investment calculator that helps you figure out exactly how many shares you can buy with your available funds, including the transaction cost. Opening an account is fairly standard, and can be done over the Internet pretty quickly. I think I opened my account in less than 20 minutes. You can easily set up your automatic investment plan so that you invest in what you want regularly, and you can also choose which day (among set options) works best for you. ShareBuilder includes research and different tools to help you manage your portfolio. You get access to better, more detailed research if you are using a paid automatic investment plan. Non-paying accounts can still access research and tools, though, and that is helpful. The research available is about average when compared with other online discount brokerages. One of the tools that makes ShareBuilder easy to use is the portfolio builder. This tool allows you to input your investment goals, as well as share your style. Then, a portfolio suggestion is created. You can use that as a guide. This is a tool that is helpful for new investors. ShareBuilder lacks some of the investment tools and abilities that more advanced traders often look for, and the cost is fairly high for day trading, so if you are an investor that requires more choices, and greater access to premium research and advanced tools, ShareBuilder probably isn’t for you. ShareBuilder is best-suited for the investor who wants to set up an automatic investing plan and let it go at that. As long as you choose an index fund or ETF with relatively low costs attached, or if you choose a solid stock, you can see benefits. Transactions are low-cost when you use the automatic investment plan, and ShareBuilder’s fractional investing means that every dollar you invest goes toward building your portfolio. However, when you aren’t using the automatic investing plan, the costs at ShareBuilder can be higher than average for a discount brokerage. If you know that you will be making extra trades, another broker might be best for you.